I know it has been a while since I have updated about the E*speed motorcycle, but I promise not to disappoint. 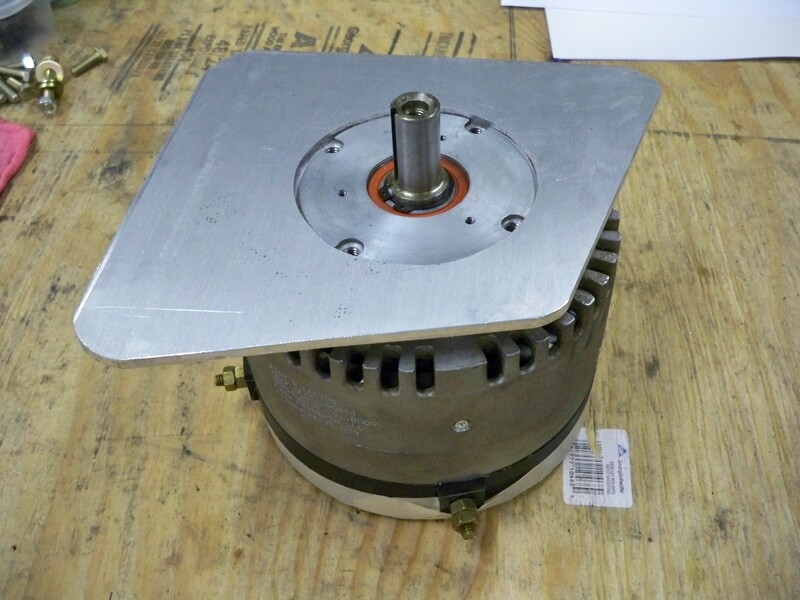 I made a few key decisions about what type of motor I wanted this time, I wanted higher RPM and wanted to keep it DC so I did not have to replace my speed controller. I decided to go with 2 Mars “R” motors wired tin parallel with the controller. With this setup I will have more torque and higher RPM for all around better performance! 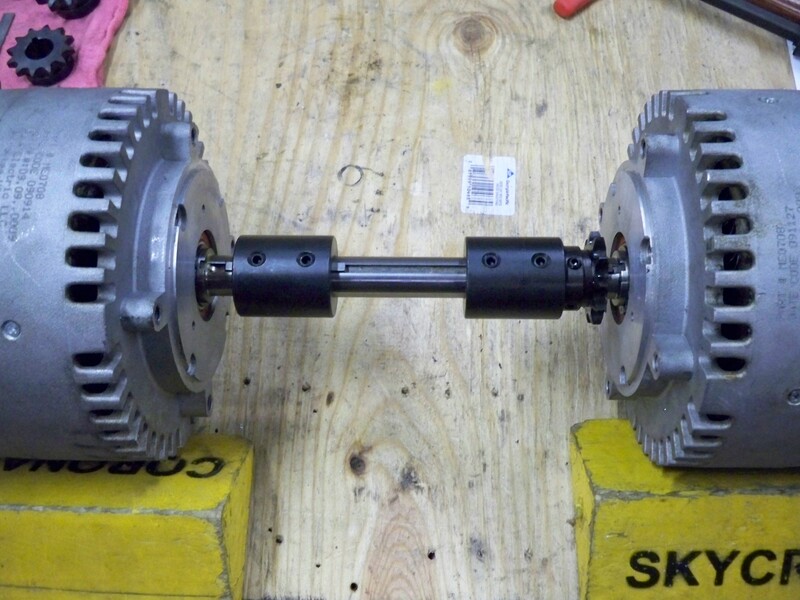 The motors are shafted directly together with keyed couplers, and the sprocket if offset to the left side to provide correct chain alignment. Making sure the motor sprocket is aligned with the rear wheel sprocket. After a lot of careful measuring and many cardboard templates I finally got both of the 1/4″ aluminum motor brackets cut out. I placed one motor exactly where it should be (offset on the bike) to determine what length bolt spacers I would need to make to make to have the motors sit exactly where I nee them too. After attaching both motor plates I used a 1/2″ diameter threaded rod between the front of both mounts to make them very rigid and strong. This also allowed for slight adjustment of the plates if they were not parallel. These are the spacers I used to offset the motors from the frame to allow for chain clearance. Luckily my hard work and patience paid off, the motors aligned up perfectly! Now I am ready to run chain and mount the LiFePo cells back in the bike. 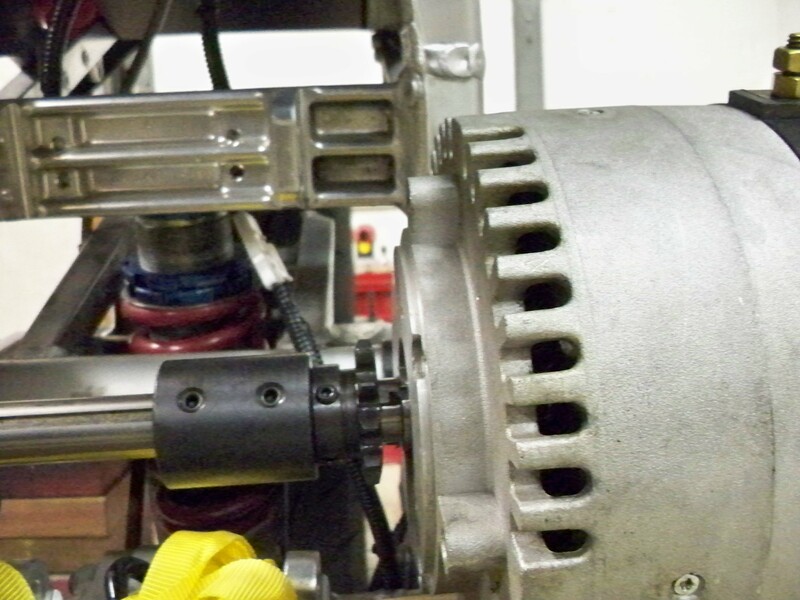 By the way, the back of the motors are taped up with masking tape to prevent scratches and dents. 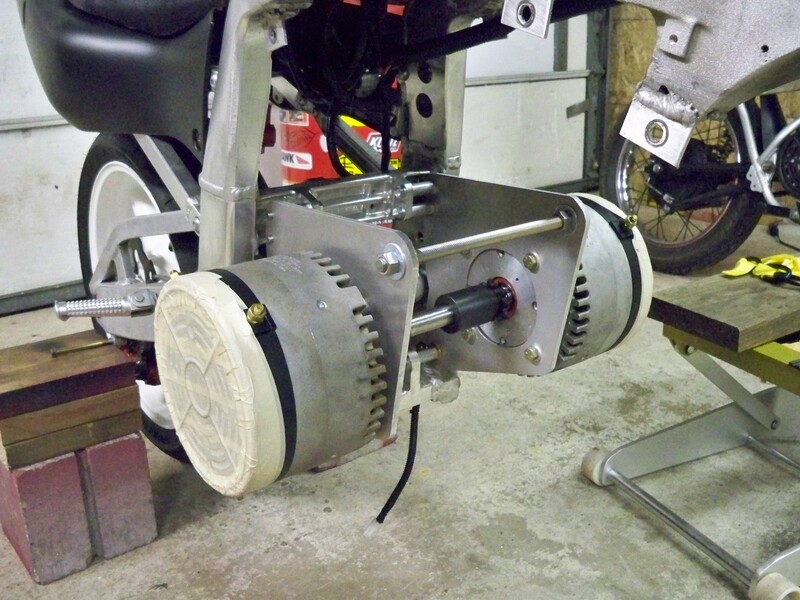 This is an example of how I am going to mount all of the battery cells in the motorcycle, this will allow for low center of gravity, close battery terminal locations, and will allow for “slide-in-cells” for simple installation. 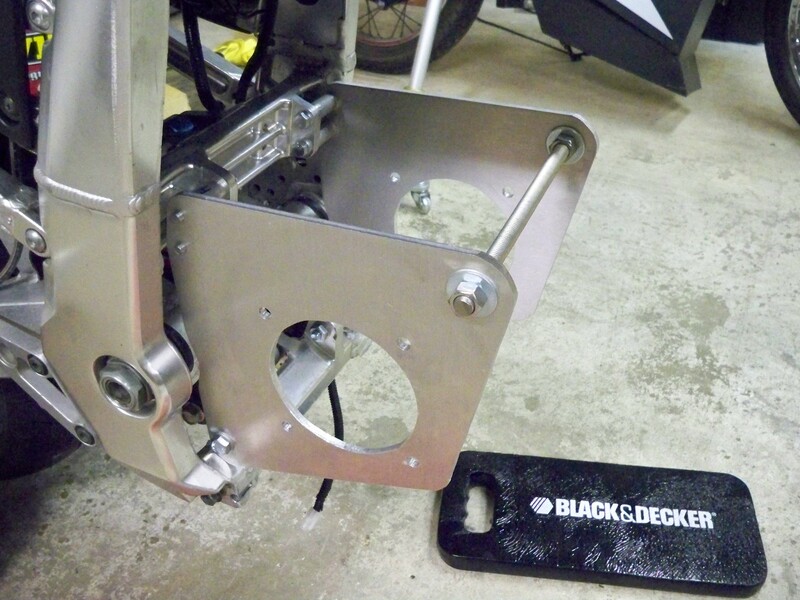 I also wanted a flat and very rigid bottom so I can use my motorcycle floor jack for service. I am in the process of building the battery rack and re-wiring the power grid. I should have the motorcycle in testing phase within the month of July, stay tuned! 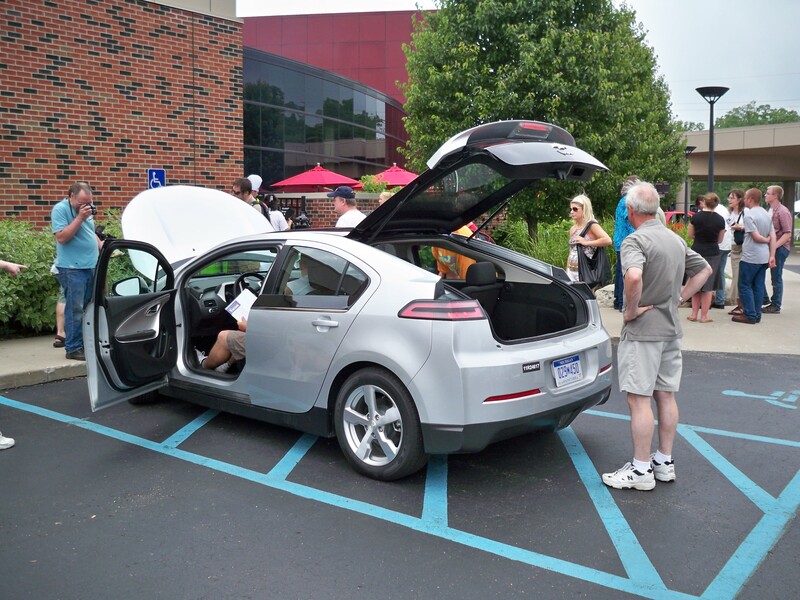 Last Saturday was the second annual “Michigan Electric Vehicle Association” meet in Livonia Michigan near Detroit. 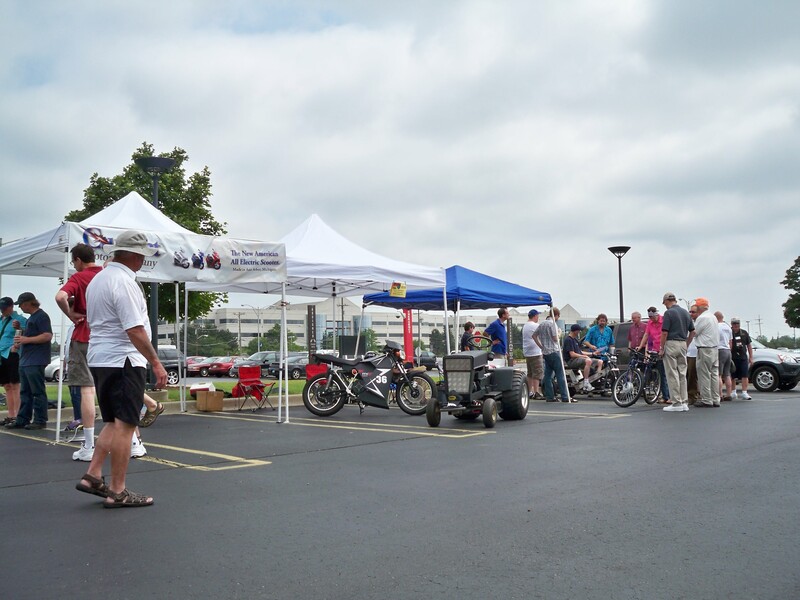 The event Brought many people out with their Electric vehicles or Plug in hybrids, everyone there was excited to display their vehicles and share their knowledge. Many home built conversions, custom 3 wheel vehicles and many production scooters, and cars were available for test drives. 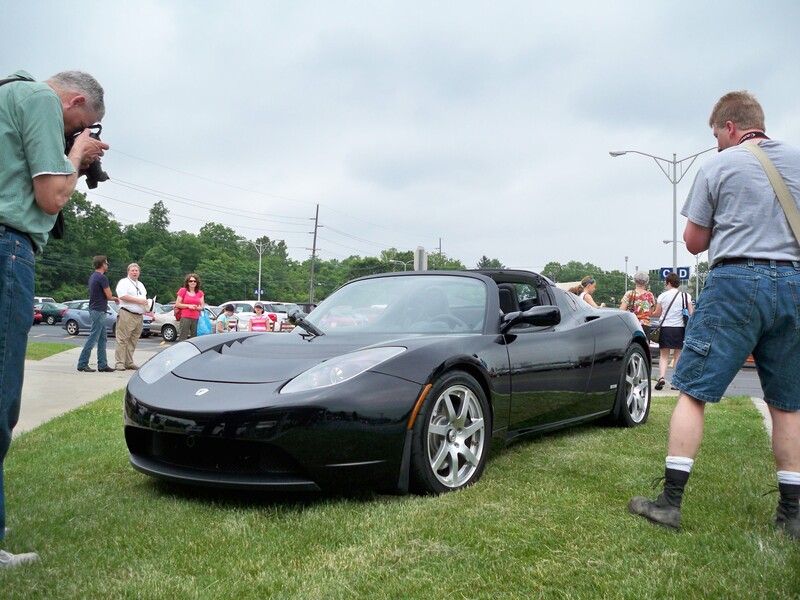 Luckily the weather held up and we had no rain, everyone there was happy to see two major production electric vehicles there, the Chevy volt and the Tesla Roadster Sport. Both were very impressive vehicles and I am very excited to see what the Tesla model S has to offer. The show was very well attended by both EV owners and enthusiasts, Schoolcraft college has been an amazing help for us both years now, they had their culinary program grill and awesome lunch, and they have gave us ample space to display and race our vehicles, a big thanks to Schoolcraft College for helping make this possible. The show had many nicely converted vehicles there, even a few for sale! Kraig Schultz set up his tent to the right of mine and Current Motor Company was on the left displaying their scooters. 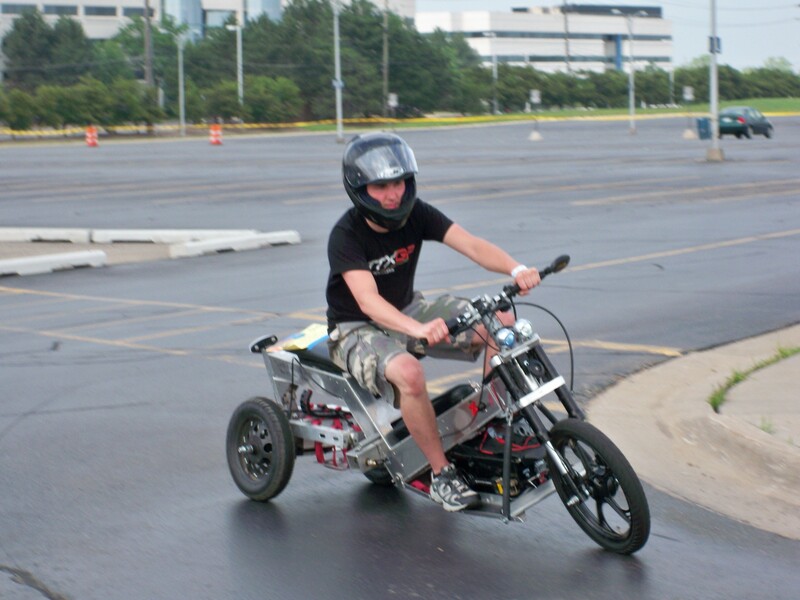 Kraig Schultz was showing off his nearly completed, but operational, Delta series of tilting trikes/motorcycles. He plans to start producing them as soon as he has finished the prototypes. 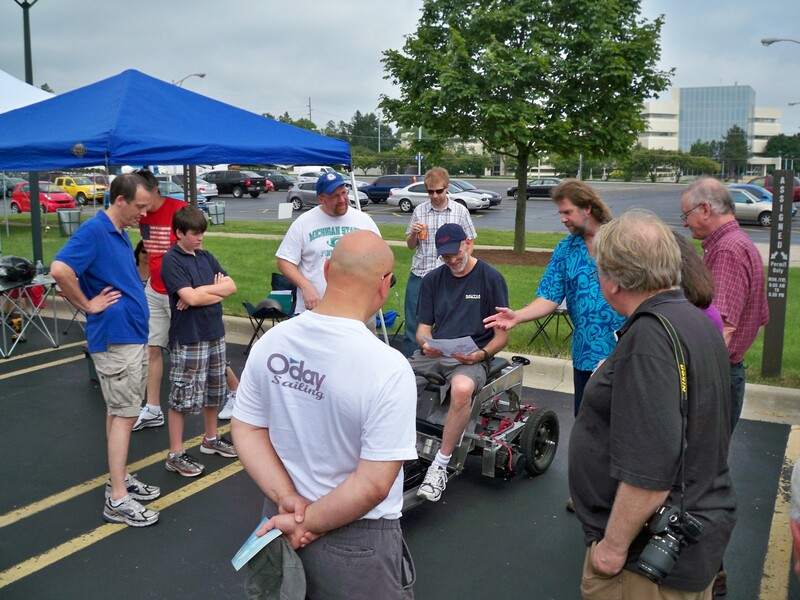 He ran his trike around the parking lot all day and through the auto-x without any problems, many people were interested in his design! Eventually I got to ride his tilting trike (Delta-12) and it was surprisingly fun, with the tilting action you quickly forget there are 2 wheels behiend you. The double seating position gives you either good visibility or better agility and aerodynamics. 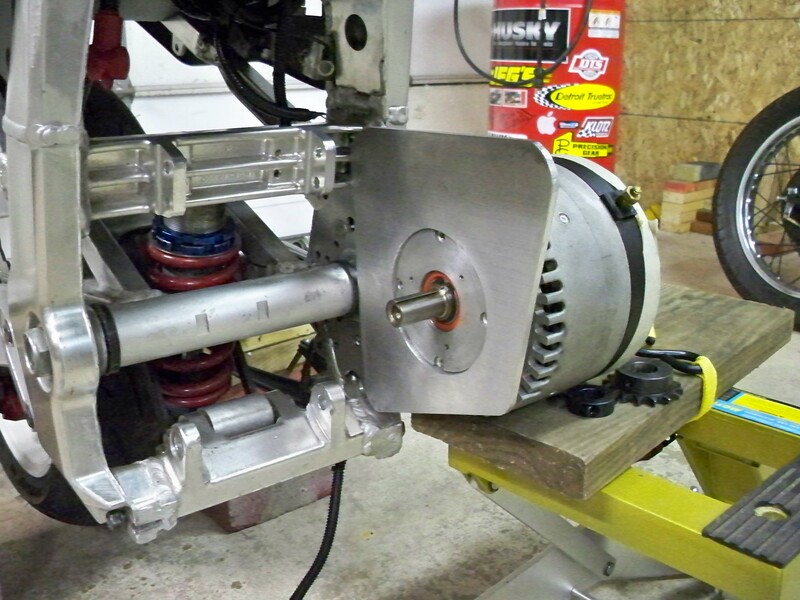 For more information on Kraig Schultz inventions and products visit his website, there is a link on the side bar. 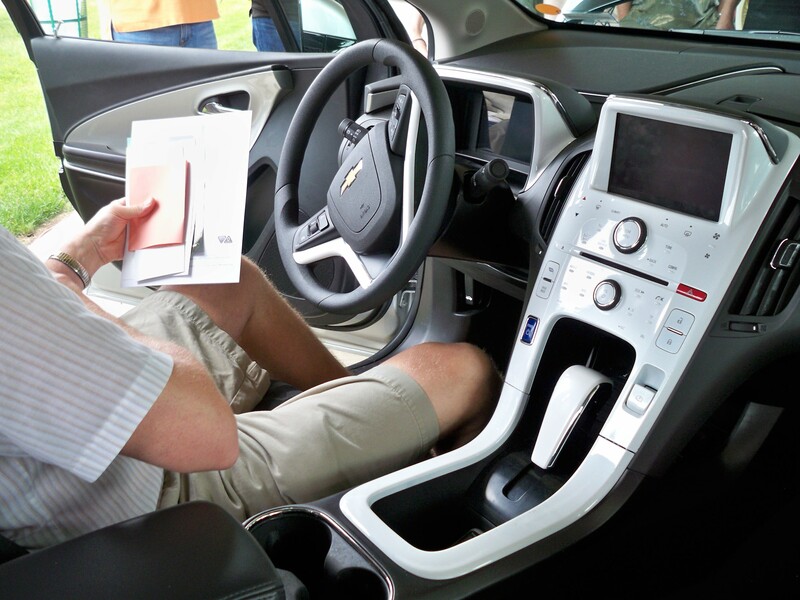 And GM was very enthusiastic with their prototype Chevy Volt plug in hybrid. The GM representative was giving people test rides all day and really let you get a feeling of the car. The interior is very unique with cell phone like heat sensitive buttons, and a recessed shifter knob. The rear seats are smaller then I expected from a 4 door sedan, but all in all it should be a good GM plug in hybrid. Luckily the rumor was true, the famous Tesla Roadster Sport decided to make a fashionably late entrance. As you may have read in my previous posts, the Tesla Roadster is one of the most impressive pieces of technology to date, with 240 miles range, lightning fast 0-60 and 120mph top speed with NO transmission, it has made the super complicated internal combustion 5 speed transmission a thing of the past. The owner of this Roadster decided to give many people rides, and he did not skimp out, he took it up past 60mph in the parking lot, everyone who got out of it had a grin from ear to ear, its something I hope everyone gets to experience soon. 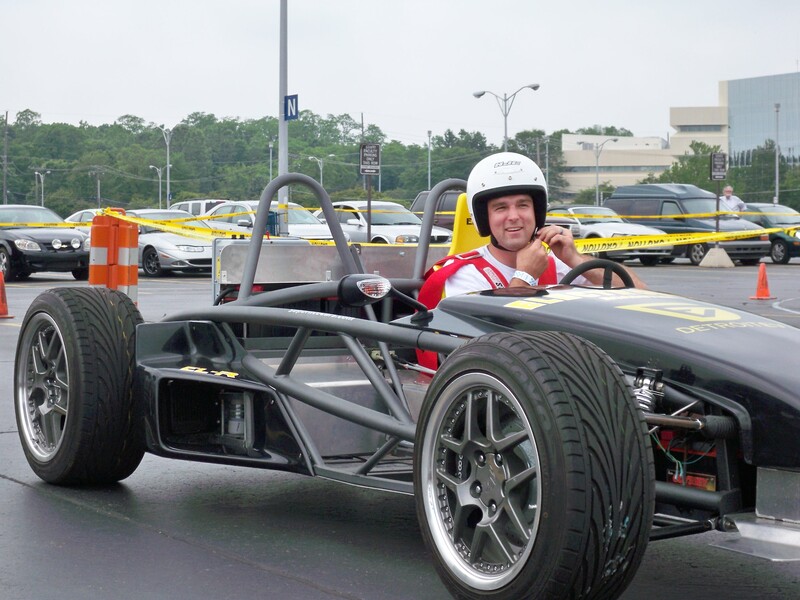 The Tesla Roadster driving the auto-x race course. 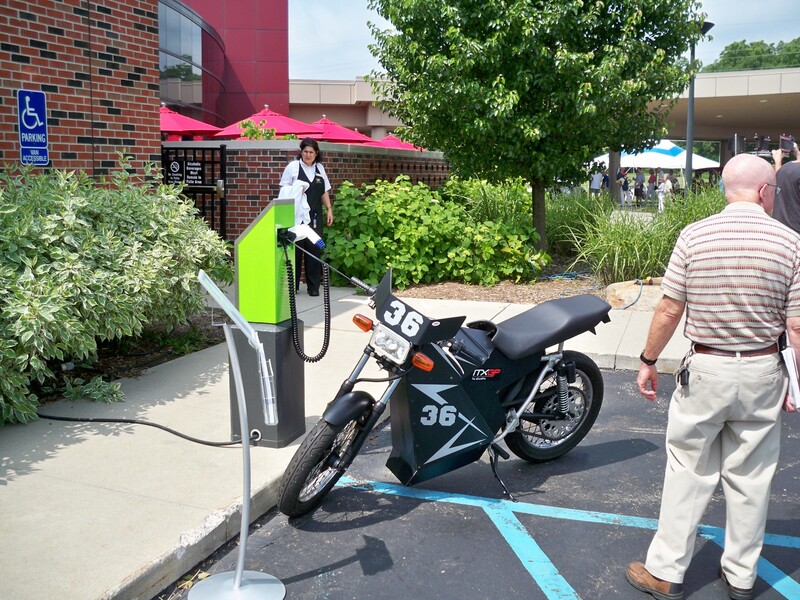 After driving my motorcycle around for demonstrations, I needed a charge (I really didnt need one, just needed an excuse) so I decided to park it in front of the new “PEP” charge stations. These are simple 120/240 volt charge stations that will accept any credit or debit card. The touch screen menu is very user friendly and simple to operate, if you can plug in a kitchen toaster you can easily use a pep station to charge your EV. The distributor told me these stations are becoming very popular to install and they have many contracts to install them in various cities across michigan. 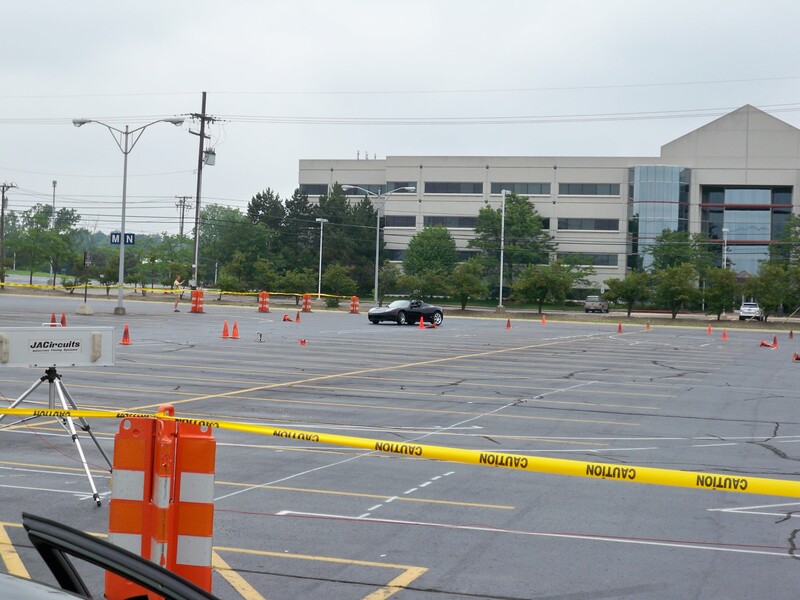 Soon later the Auto-x (auto cross) started, we ran all of the 4 wheel EV’s first, the Electric tube frame roadster took the prize for fastest 4 wheel EV. After many attempts through the course I could not beat my time of 28.6 seconds. 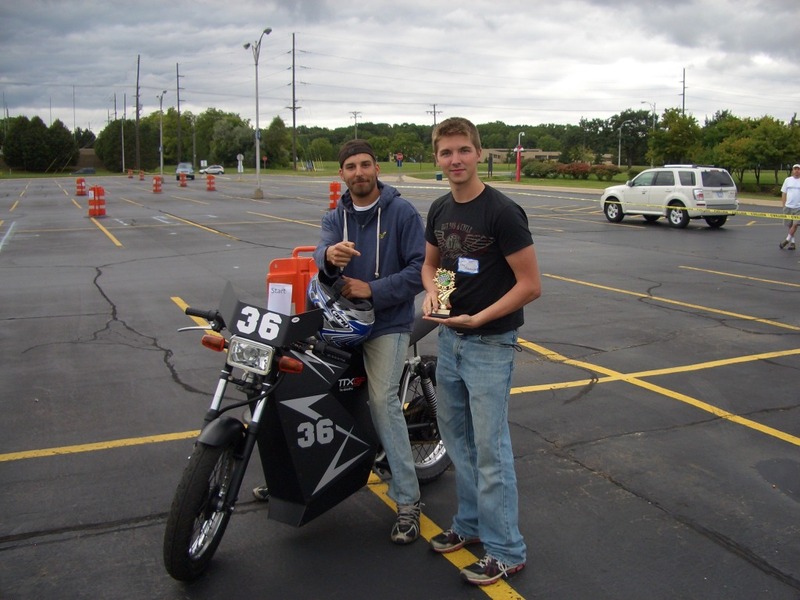 The SCCA setup up the course this year and there were many tight turns with un-even pavement, but even so the torque and small size of my motorcycle took the fastest 2 wheel EV for the second year running. Hopefully I can keep this trend going for a while! 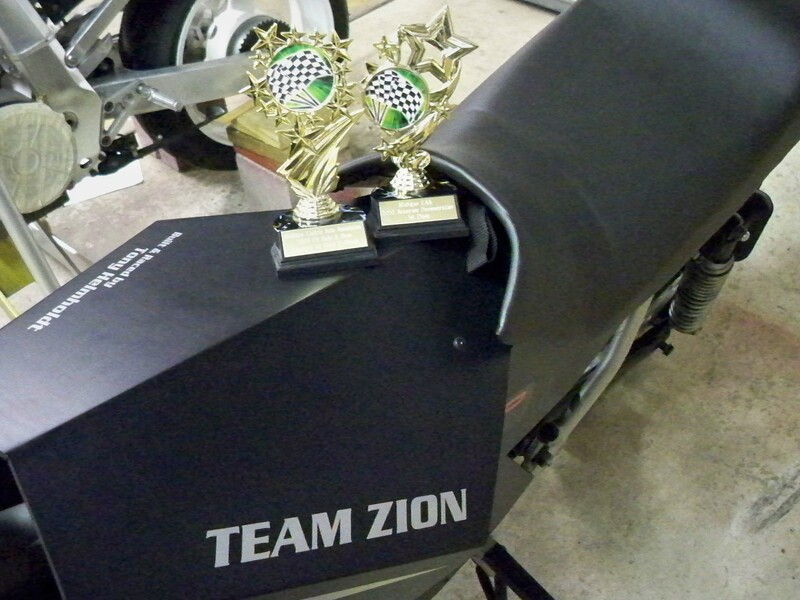 I will be out at schoolcraft college in Livonia Michigan this Saturday the 12th with my “Zion” motorcycle. I will be racing it through the auto-cross course that will be setup there. 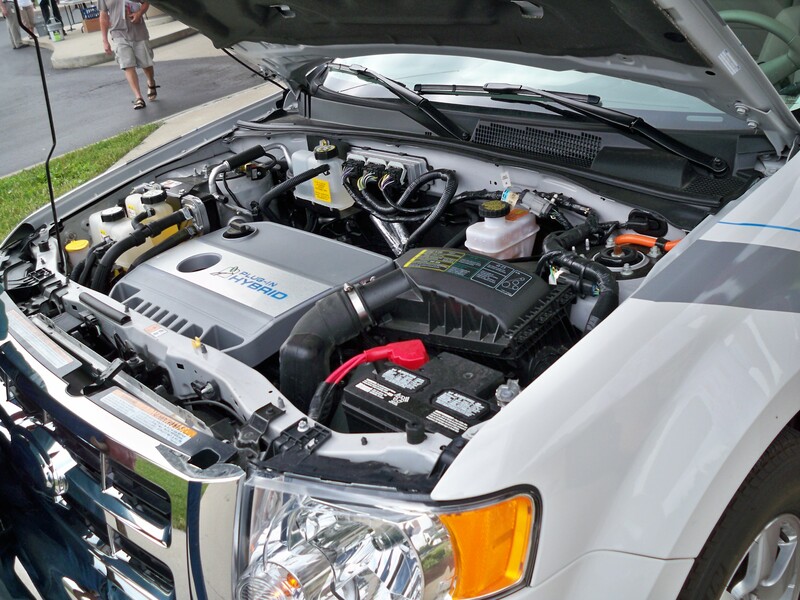 There will be many other electric vehicles and Plug in hybrids there showing off there efficiency and technology. Many people attended last year and we hope to have many more attending this year. Trophy’s will be handed out to vehicles there under many categories. There has been rumors of a Tesla Roadster that may be attending, I cannot verify this so just cross your fingers. If you read my blog and you are out there please come say Hi, I would love to talk to you. This is how easy charging an electric vehicle should be. 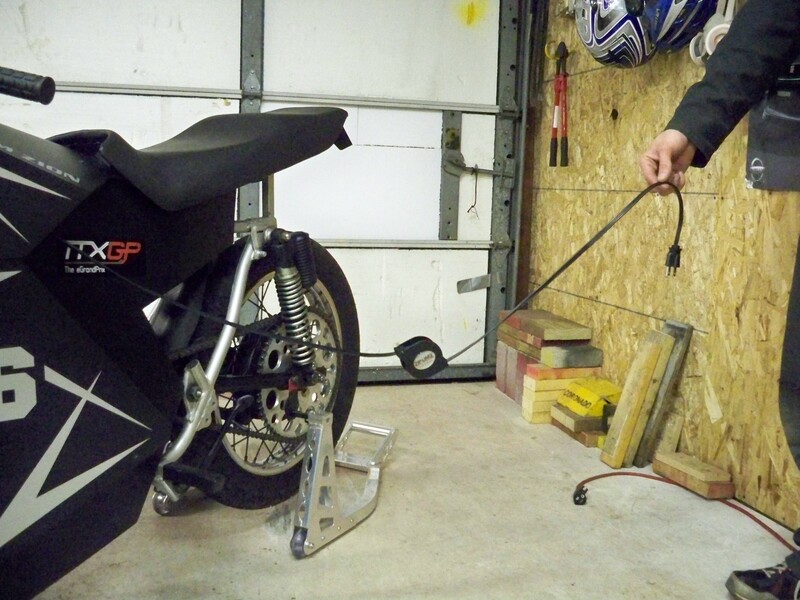 After installing the Soneil on-board charger on the Zion motorcycle, I had to brain storm a neat, simple, reliable, and quick method to plug the motorcycle in. I had many ideas ranging from stuffing the cord in PVC tube, or even using one of those electrical cords that are wound like a spring. many days passed and my brother and I thought of using a cord like on old vacuum cleaners that can self wind up. My brother suggested that I use his very old vacuum and gut it for the cord and wind-up apparatus. But a quick search on Amazon.com yielded me surprisingly good results, I found this small retractable 110v extension cord. It is designed for traveling and using to charge lap-tops and other devices. Luckily my Soneil charger only draws 1 amp, so this cord will supply it with ample power. 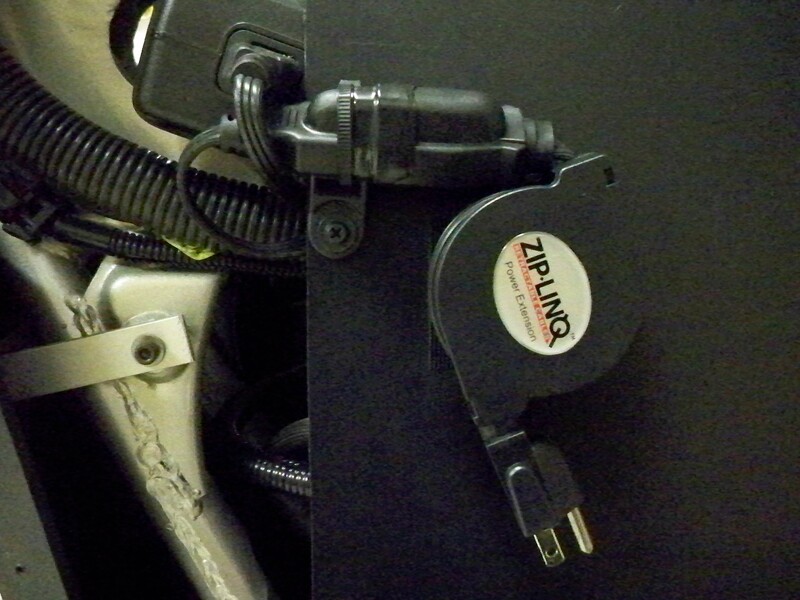 The photo above shows where and how I installed the retractable cord on the motorcycle, the left plug attached to the charger, its taped together and secured to the inner faring with a zip-tie and screw hold down. 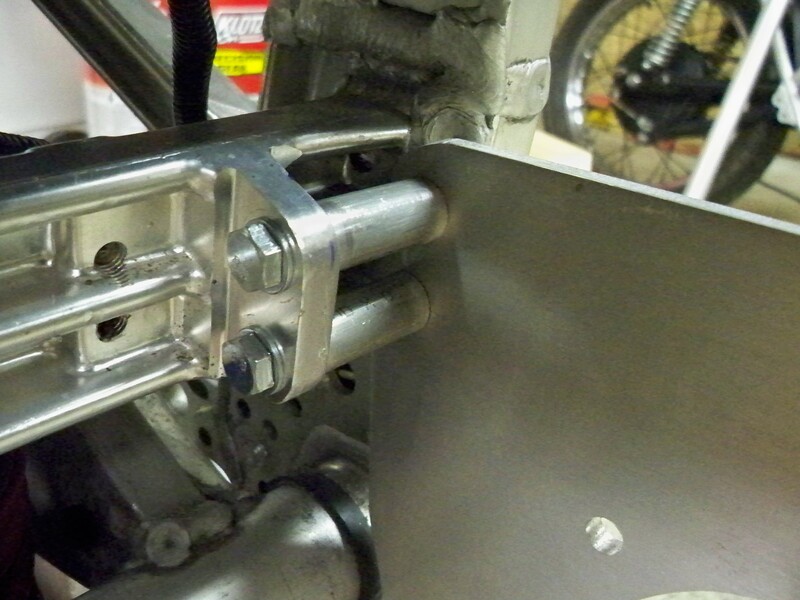 The retractor it’s self is held on by a large piece of Velcro to allow for easy and quick removal to plug the bike in. 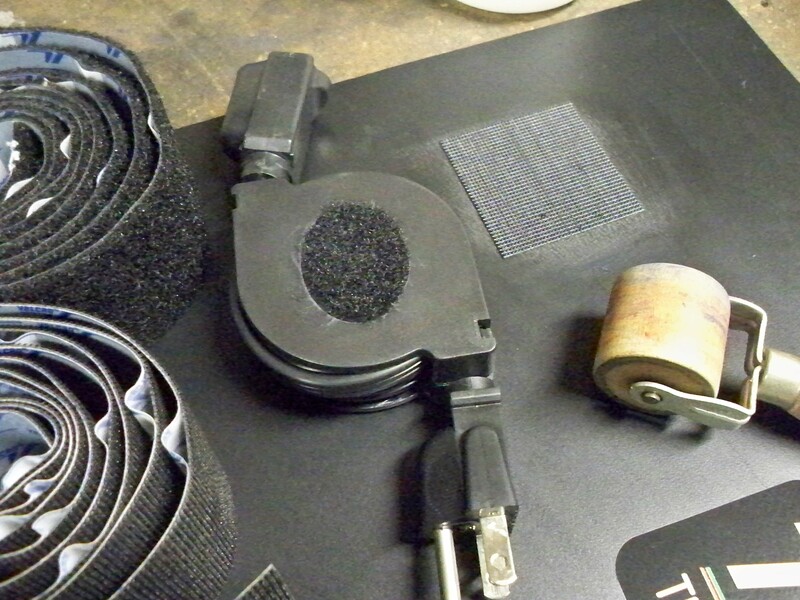 This shows the installation of the Velcro on both the inner faring and the retractor unit. The cord allows for quite a bit of length when fully extended. 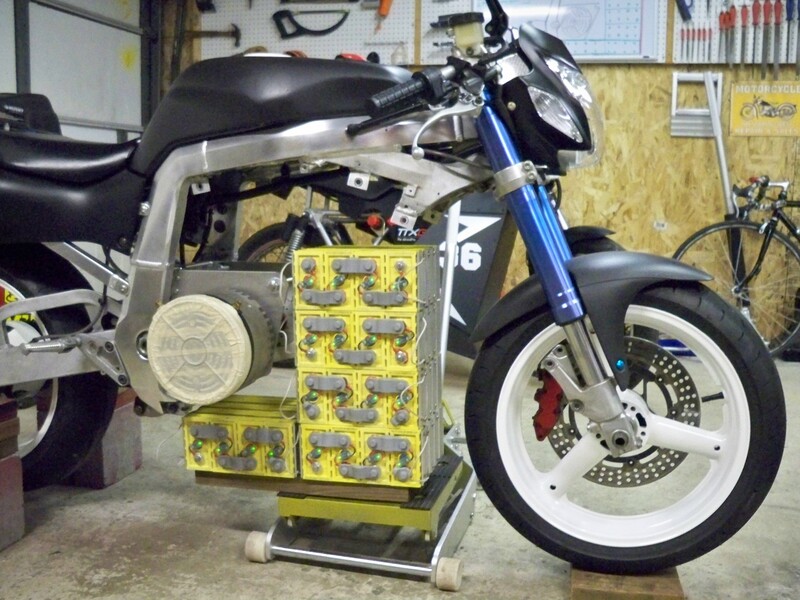 When installed on the bike, the charger does not rattle, or come loose. When you want to charge all you have to do is grab the unit, pull it off the Velcro, and pull it out, then plug it in and walk away!